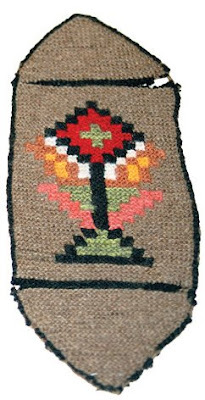 The sweater is inspired by old Icelandic shoe-inserts decorated with a Flowerpot motif. Flowerpots are a very common motif but the way it is stylised on Icelandic inserts is a little bit unusual. The Flowerpot determines the shape the garment takes. I must admit it drove me a little crazy to achieve this result. My first prototype had a bigger (with more normal proportions) waist than the one on the chart, leading to a rather baggy look. I had to reduce it considerably to achieve the slim fit effect that makes the sweater work. I know the waist on the chart is so tiny, it is almost scary... The arms were also a problem. I think I knitted them 4 times, with all sorts of decreases, ending up with the most simple shape : straight. But it made the difference. 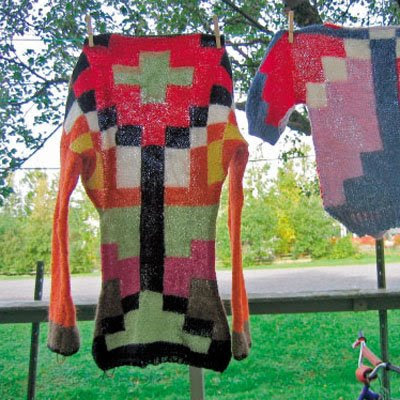 By the way, for the sweater to look good, you´d better have a flat stomach (and a not so flat chest !) Having had 3 children in 5 years, I still have some work to do on my abs ! 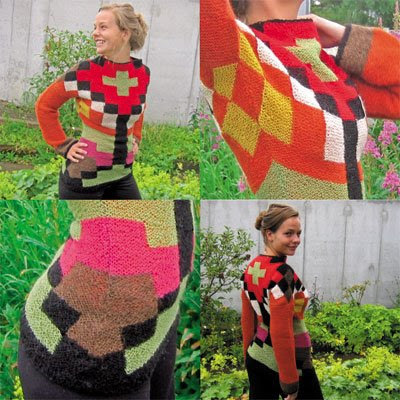 I saw this sweater today on Maria in the yarnshop Mariasgarn in Stockholm. Very nice....! Thanks, I had actually seen the sweater on Ravelry ! Beautiful colours !